There are at least three writers in English with their surnames Punchihewa contributing in this country. One of such writers is P. G. Punchihewa. Some years back he wrote a novel in Sinhala called Gana Bol Polowa and had now brought this in English in his own translation titled The Shattered Earth published by Stamford Lanka (Pvt) Ltd. 336, High Level Road, Pannipitiya. Who is P G H? He belonged to the former Ceylon Civil Service and was the Government Agent of Moneragala District from 1967 to 1970. He graduated from the University of Peradeniya. Fine. What is his novel about? The blurb helps us to see what the writer’s intention had been in writing this docu-fiction depicting the stark reality in the south-eastern district which comes under the Uva province. “The story revolves round Kirisanda, a chena cultivator who struggles hard unsuccessfully to withstand the onslaught of the outside forces”. To those of us who are not familiar with the terrain and the Sinhala language, this English version is remarkably authentic. One is even made to think about the sordid life in the arid soil of the Northern and Eastern dry zones. It would be obvious that this book would serves as case study for sociologists, economists and social- conscious people amongst us, not excluding the literati. This column as its title suggests is not a space for full-fledged piece of literary criticism, book review but an account of the columnist’s understanding of the material he gleans from that might help the uninitiated reader to go for the source and enjoy. In the late 1960s Moneragala was economically and socially was the poorest. (It may be so even now, the columnist believes)... The b nearest base hospital was in Badulla, forty miles away. Neither pipe-borne water nor electricity was available even the district town...The majority of the population depended on Chena cultivation. Excuse me Sirs, we don’t have any trays here. Not even saucers, just the cups. It is said that when you visit the bat’s home you must not look for chairs. You must hang on to the roof. ... of course some say this is a ruse to hoodwink the income tax people by claiming losses. In any case I have heard that whatever profits they take on this project will be exempt from tax. Inside the jungle they found the atmosphere cooler. The leaf cover of the giant trees was like a great green canopy held over scared a hare and it ran ahead of them for a short distance and vanished. A group of monkeys seeing the party got excited, shrieked and fled into the jungle. Apart from that there was hardly any sound. I have given excerpts only from the first five chapters out of the 22 in the novel. The book is not only a record of actualities some 45 years ago prevailing in the Moneragala district but also a commentary on the social and even political issues of the day. 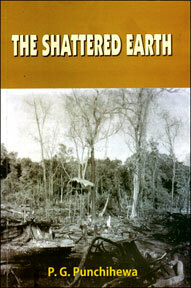 Reminiscent of Leonard Wolf’s The Village in the Jungle, P G Punchihewa’s The Shattered Earth is both the jungle eating into village, and also a shattering of the earth. The writer writes the novel in an interesting manner and the reader would not be disappointed. The book also has a useful glossary that would help those who are totally ignorant of the Sinhala language to understand the context of the novel. I liked the novel very much. To explain: EMGE asked this columnist to speak at the launch of his book.